One type of automobile accident that involves delivery and transport trucks occurs when a piece of cargo falls off of the truck and causes a traffic accident. The piece of cargo may not have been properly secured in the truck or may not have been properly tied down and becomes loose during transit. The cargo might fall off the truck and directly strike a vehicle, or might fall onto the roadway causing an accident when vehicles hurriedly swerve out of the way to avoid hitting it. It is unfortunate to be involved in an accident caused by a loose piece of cargo. Truck accident victims can suffer serious injuries in these accidents, ranging from broken bones to head injuries, neck and spine injuries, and psychological trauma. The injuries can take a long time to heal (or may never completely heal) and can have a life-long impact on a victim’s day-to-day life. These accident victims also often suffer serious damage to their vehicles during the accident. Who is Liable in Loose Cargo Accidents? Victims are not usually at fault when accidents involving loose cargo occur. Short of following too closely, or being distracted while driving so that you could not respond to the emergency situation involving the loose cargo, you likely had little control over the course of events that resulted in the accident. So, who should be held liable in situations like these? Usually these types of accidents involve multiple labile parties. First, whoever was responsible for strapping down the cargo in the first place will need to be held accountable for doing a poor job (assuming improper securement of the cargo was a cause of the accident). Next, the truck driver will most likely be accountable because most commercial truck drivers are required to perform a pre-trip inspection before making a long haul, and one aspect they are suppose to check is that the cargo has been properly secured. The truck driver’s employer could also be held accountable, through a doctrine called respondeat superior. Accidents involving commercial trucks and commercial vehicles often have multiple sources of liability that need to be explored so that victims get the maximum possible compensation that is available to them for their injuries and property damage. Truck accident victims should work closely with an experienced Nevada truck accident lawyer to pursue all possible avenues of recovery. Truck accidents due to loose cargo are not to be taken lightly. These accidents are responsible for causing serious property damage and major injuries. Anyone who has been injured in an accident stemming from a loose piece of cargo needs to consult with a personal injury lawyer immediately in order to preserve and protect his or her rights. These accidents can be complicated, so truck accident victims need to be represented by skilled and experienced Nevada truck accident lawyers. Please give our office a call. 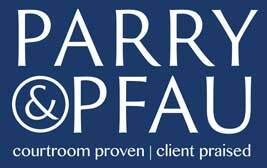 The team at Parry & Pfau is happy to schedule a free initial consultation with you. Newer PostIs it Legal to Wear a Mackintosh in Nevada? Older PostIs it Legal to Wear Masks in Public in Nevada?